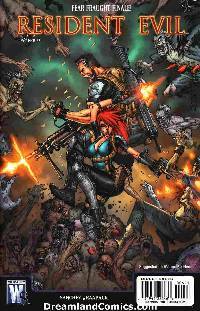 Written by RICARDO SANCHEZ Art and cover by JHEREMY RAAPACK The original miniseries based on the best-selling Capcom game comes to its dramatic conclusion! Holiday Sugarman goes one-on-one with the bio-weapon-enhanced Giesel while Mina Gere leads BSAA forces in a desperate attempt to stop Giesel's apocalyptic failsafe device. Don't miss the stunning finale!